The Trust is involved in a number of research projects to help understand more about yellow-eyed penguins, their behaviour and the impacts facing them. Stable isotope analysis can be conducted on feather, bone, muscle or blood samples from penguins. We look at the ratio of carbon and nitrogen in these samples – nitrogen indicates the trophic level that the penguins feed at (i.e. how far up the food chain) and carbon helps to determine the primary source responsible for energy flow in an ecosystem. By comparing historical and modern hoiho feathers from both the sub-Antarctic and mainland New Zealand for the we can work out whether there have been any changes in the ecosystem which reflects in what the penguins are/were eating. Multibeam echosounders (MBES) can be used to create high resolution bathymetry and geo-referenced images of the seabed. 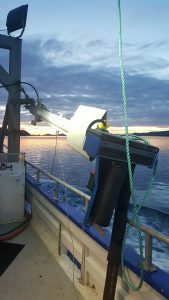 Trials have been conducted with the University of Otago (Surveying and Marine Science departments) off Otago Peninsula over the seabed where penguin foraging has been observed. The aims of the trials are to test the MBES as a tool for investigating the benthic environment used by penguins, to examine what seabed features make important foraging areas (e.g. substrate type, depth) and examine any evidence for human impacts on the seabed (e.g. disturbance from fisheries, dredging). Long-term we hope to map important benthic habitat off the Otago and Southland coast, highlighting specific habitat types. The data can then be used to examine the extent that human impacts overlap with penguin foraging habitats, and highlight areas requiring marine protection. We know little about the habits of yellow-eyed penguins at sea. With the aid of satellite technology, studying penguin behaviour at sea using mini GPS logging devices attached to individual birds has opened a new window of opportunity. The devices are attached to their backs using adhesive cloth tape, which allows for easy detachment without causing damage to the penguin’s feathers. Loggers can record the penguins’ dive depths at given intervals as well as their geographical position after each dive. By studying the foraging behaviour of hoiho at different locations, we may shed light on where they feed, the depths that they dive to and how consistent these are for individuals and colonies over time. This will allow us to examine when and where penguins overlap with human activities and shed light on how we can better protect them. The Trust has established an ongoing working relationship with the Otago Polytechnic to develop new ways of monitoring hoiho. Students are currently working on ‘smart’ nest boxes which will be able to remotely collect data on which bird has accessed the nest, their weight and how often the parents guard the nest for before changing over. Collecting fine-scale data about individual birds and nests will enable us to answer questions about how long foraging trips are, how much each parent invests in raising their chicks, the birds (adult and chick) weights throughout the season. In the future there is potential to expand this work and add other sensors, for example, temperature loggers.